Inspired Art 2014 was a wonderful evening! Thank you to all the amazing artists who donated their time and talent and the more than 125 attendees who admired the wonderful poetry and matching unique pieces of art. This event truly shows SCORES' youth how powerful their words can be, and the community how intelligent and thoughtful Milwaukee's children are! You can view pictures from the event on our Facebook page. 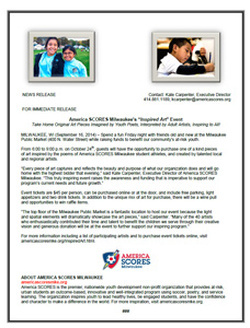 Click the image above to read the 2014 Inspired Art press release. The Inspired Art project takes poems written by America SCORES Milwaukee youth and asks local and regional artists to create one of a kind pieces inspired by their words. Each piece of original artwork is photographed and compiled into a graphic collection of SCORES art and imagery with selected pieces brought to auction in a gallery-night themed cocktail event. Inspired Art truly brings the words of SCORES youth to life. Artists of all types including painters, graphic and fashion designers, sculptors, jewelry makers, architects, etc. Artists will work on their pieces starting in April through October. The Inspired Art event will be held Friday, October 24th. Inspired Art introduces the words, reflections, and experiences of SCORES youth into the community. Creative interpretation by artists shows our youth the power and limitless impact of their words and voice. The Project raises money so that this important work and programming can continue to be offered to Milwaukee's urban youth.